Here at Rogan’s Shoes we know how important your self comfort is. That is why we dedicated this week’s blog to a shoe that we all know and love...Moccasins! Moccasins are perfect for your day spent lounging in the comfort of your own home, running your weekly errands, or walking to and from class. Moccasins are perfect for all seasons and we want you to check out some of our NEW and favorite men and women moccasins we have in stock! Minnetonka Newport Women’s Mocs: Kick off your day sporting these mocs. Not only are these perfect for lounging, they also are perfect for outside wear as well with their athletic-inspired outsole for outdoor traction. They will also keep your feet nice and cozy throughout the day as they feature a fully padded insole. Now we know that comfort is not everything, style also plays a big role into what shoes we love. 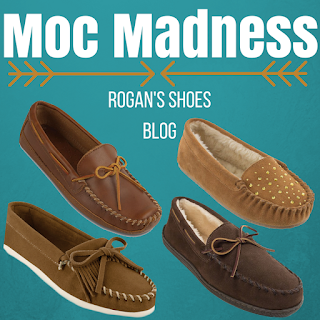 This specific moc has a trendy and unique style to it with its fringe upper and frontal tie, these mocs come in three great colors: Black, Dusty Brown, and Stone. Pair these mocs with cuffed jeans a sweater and scarf to complete your look! Minnetonka Cowhide Slip On’s: This Moc is perfect for your casual dress days. A great feeling shoe with a great look to them. Their soft, durable leather upper will provide you with a comfortable feel. These mocs also have a cushioning foot bed with a rubber bottom allowing your feet to stay safe and durable while running around out and about. This crisp and clean looking Moc will tie together your outfit of the day and keep you looking in style all year long. Minnetonka Rhinestone Women’s Slippers: These mocs will have you feeling like you have been walking on the clouds all day long. With their faux fur lining and rubber outsole your feet will stay cozy and stable while you are sporting them. These mocs are as cute as they are comfortable. With their rhinestone detailed upper your feet will be the star of the show and will have all eyes on them. Spice up your relaxed style with these mocs and remain in style and comfort. Minnetonka Hardsole Men’s Slippers: These“Jack of all Trades” Mocs are perfect for any occasion. Dress them down for a laid back and relaxed look or dress them up and pair them with khaki pants or jeans and a nice button up for a casual put together look. Not only will you remain in style with these Mocs you will also stay super comfortable with their suede leather upper, padded foam insole and faux fur lining, making these mocs a must have in your shoe collection. After reviewing some of our must have mocs we hope you found a pair to step in style and comfort with on your busy to do days or days spent lounging around. However, if you did not find a pair that caught your eye check out our website as we still have many different Mocs to meet your needs of comfort and style! Be sure to follow us on Facebook, Instagram and Twitter! If you have any questions, do not hesitate to contact us. One question you may ask yourself while trying on safety shoes is if the boot fits. Luckily, Rogan's Shoes has created a guide on how to fit safety shoes and boots. Many of the problems with fitting safety footwear result from poor fitting! Take the time to get your foot measured and find a quality boot that fits your foot with comfort. 1.) The best time to buy boots is in the afternoon or early evening when the foot is at its largest. 2.) Bring the socks you plan on wearing with you when you try on boots. 3.) Make your decision based on fit more than style. 4.) Get your foot measured. You need to know the correct length and width to get a proper fit. 5.) One foot is often larger than the other - size for the larger foot (get both feet measured). 1.) Try the boot on and push your toes to the front until they touch (your index finger should fit in behind your foot). Our beloved Chuck Taylor's have been keeping a huge secret from us; and I are here to expose them. Have you ever wondered what those two, out of place holes were for on the inside panel of the shoes? Apparently, they have a real purpose. Converse did not put them there as a decorative touch or a means to improve air flow to our feet. The two holes give users the option to lace up using the bar method. The bar method of lacing makes the shoe fit tighter around the foot. It is a simple 5 step process to customize the fit of the shoe even more than regular lacing does. can also prevent the risk of injury by keeping feet from sliding around in the shoe. Try out the 5 step process below to lace up your own pair of Converse using the bar method! Did you gorge on a little too much Halloween candy? Don’t let that stop you. Now is the perfect time to get back into shape and work off those trick-or-treat sweets. With more holiday treats headed your way, get ahead of the game by buying a pair of comfy running shoes and get to the gym. Let the Ravenna 8 Running Shoes help you burn those extra Halloween calories! The bright colors and sporty look make these running shoes the perfect sneaker to help you get back into shape. Start your run of right with the BIOMOGO DNA midsole cushioning that will provide full support and comfort for strenuous impacts. Whether you enjoy running or not, the vibrant style of these shoes will make any type of workout fun.